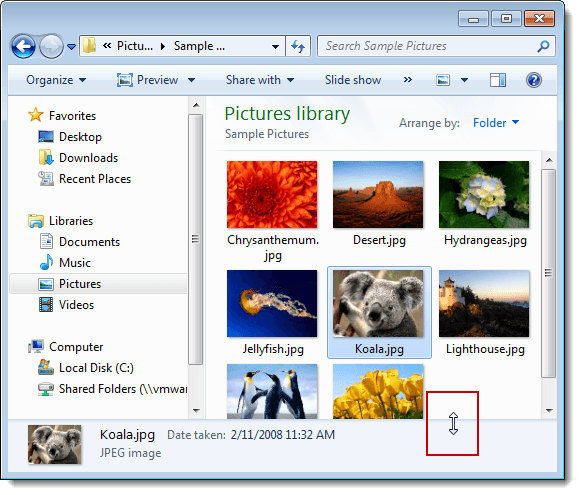 When you select a file in Windows 7, properties (or details) about the selected file, such as the author of the file, the size of the file, any tags associated with the file, and the date of the file are displayed. The properties available for a file differ depending on the type of file. For example, the Rating property is available for image files and music files, but not for text files. File properties are displayed in a Details pane at the bottom of the Windows Explorer window. 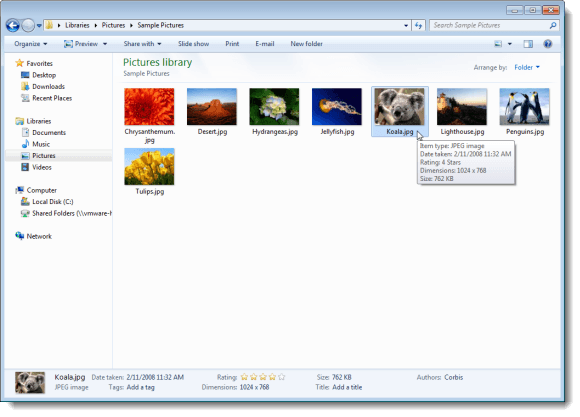 File properties make it easier to find and organize files. You can search for a file by one of its properties. For example, you can find all image files from a specific author. Libraries allow you to arrange files by properties. If you are browsing the Documents library, you may want to see which files you have most recently changed. 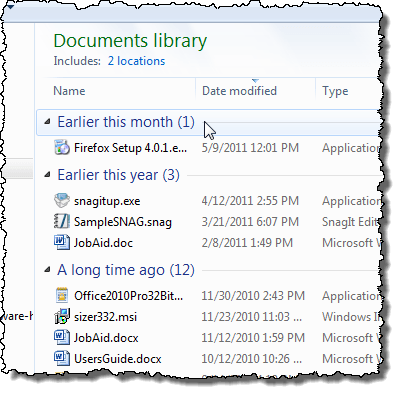 To do this, sort the files by the Date modified property by selecting Date modified from the Arrange by drop-down list. The files are then grouped according to the date they were last modified. 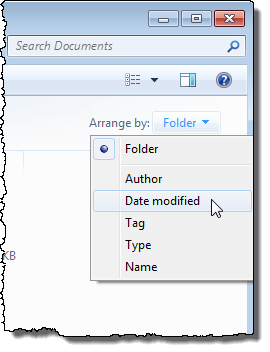 If you don’t see the Details pane at the bottom of the Explorer window, click the Organize button and select Layout | Details pane from the drop-down menu. NOTE: Any pane on that menu that has an icon to the left of the option name is not displayed on the Explorer window. A pane is visible when there is a check mark to the left of the option name instead of an icon. 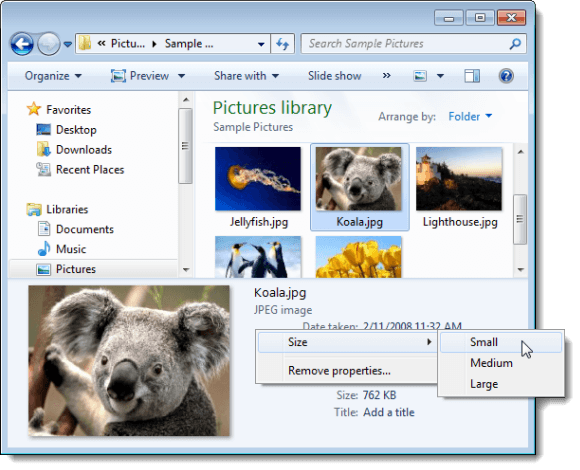 The size of the window determines how many of a file’s properties are displayed. 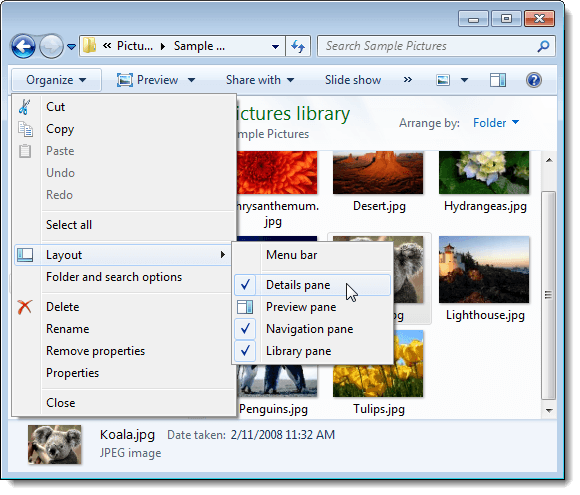 You will notice that when you make the Explorer window smaller, less properties are visible in the Details pane. You can adjust the size of the Details pane by moving your mouse over the top border of the pane until you see a double-sided arrow. Click and drag the border of the Details pane to make it bigger or smaller. More properties display as you enlarge the Details pane. You can also change the size of the Details pane using a popup menu. Right-click in any empty space on the Details pane (not on the image thumbnail) and select Size from the popup menu. The options Small, Medium, and Large are available on a submenu. The Small option resizes the Details pane to the default size. NOTE: Selecting Remove properties displays the Remove Properties dialog box, which we discuss later in this post. 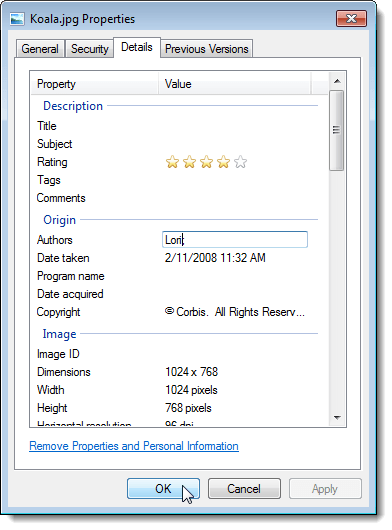 This dialog box allows you to easily remove values for selected or all properties. To change the values of a property, move your mouse over the values for the property and click in the edit box that displays. To add a value for the property, simply type the value. To remove a value, click on the value to select it. Press the Backspace key or the Delete key to remove the value. To remove all values for a property, select each value and delete it. To change a value, remove the value you want to change first, then add the new value to replace it. Once you have changed, added, or removed all the desired values for the properties you want to modify, click Save to save your changes. You can also change, add, and remove values for properties by right-clicking on the file for which you want to modify properties and selecting Properties from the popup menu. The Properties dialog box displays. 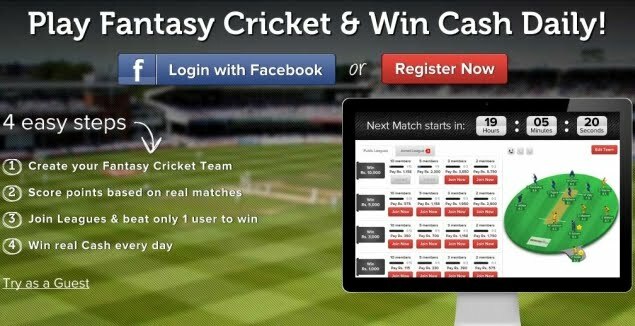 Click the Details tab. To change, add, or remove values for a property, move the cursor over the Value column for the Property you want to modify and click in the edit box. NOTE: Some properties don’t have an edit box in which you can enter your changes. For example, to change the Rating property, simply click a star to indicate the rating level you want. Change, add, and remove values for properties as desired and click OK when you have finished making changes. 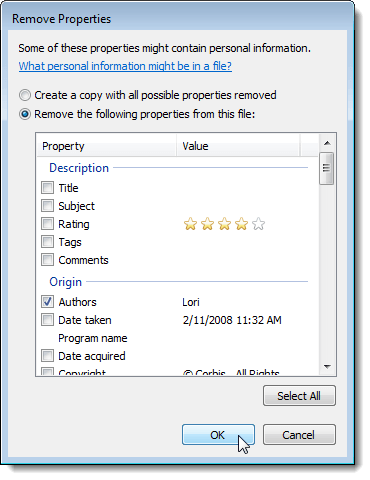 The Details pane reflects the changes you made to properties on the Properties dialog box for the selected file. You can also remove values from properties by clicking the Remove Properties and Personal Information link on the Properties dialog box (open the Properties dialog box as mentioned earlier in this post). The Remove Properties dialog box displays. You can choose to remove all properties from a file or just selected properties. To create a copy of the selected file with all of the properties removed, select the Create a copy with all possible properties removed radio button. This is a safe way to remove all the values from all the properties for a file. The original file is preserved with the values of the properties intact. To remove only selected properties, select the Remove the following properties from this file radio button. Select the check boxes next to the properties for which you want to clear the values. Click OK once you have made your choices. NOTE: The properties themselves are not actually removed. When you remove a property, the values for that property are cleared. The property is still available for the file, in case you want to add any values to it again in the future. The values for the properties you chose to remove are cleared on the Properties dialog box. 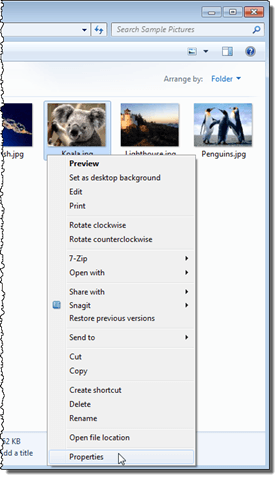 Click OK to close the dialog box. There are some types of files for which you cannot change the file properties. For example, you cannot change the properties of .txt or .rtf files. 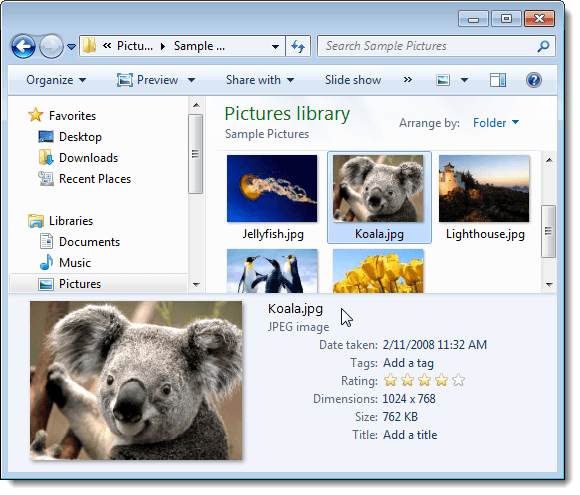 Some file properties cannot be modified, such as the length of a music file, as is also the case for Windows 7 system files or program files. You must be the owner of a file to be able to modify the file properties of that file.